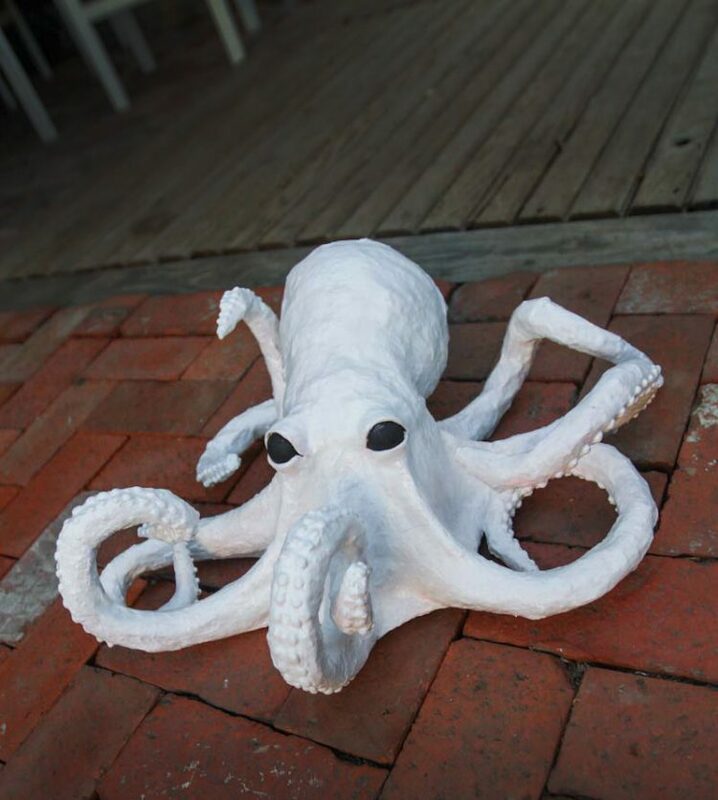 At first I had a bit of an interesting time figuring out how to make an octopus out of paper mache, as it’s a bit more of a complicated shape than I’d imagined in my mind, and from how I drew it. 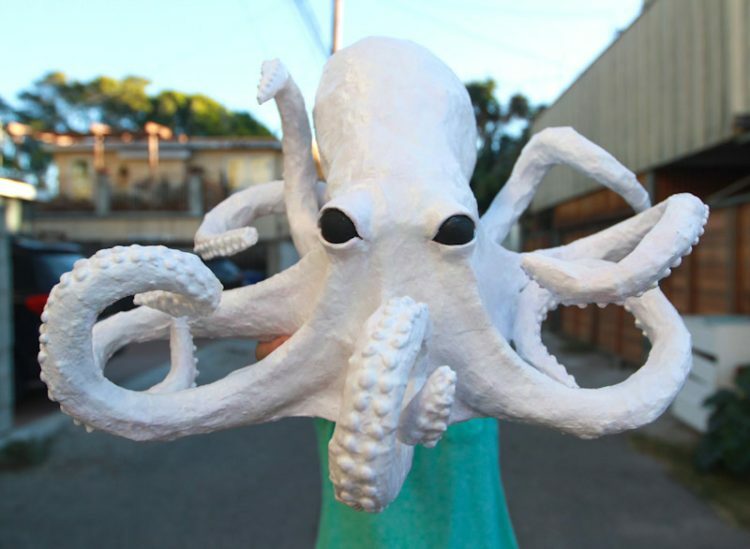 I started searching around the internet for good octopus sculptures to base this off of (you can see some of my attempts in my Halloween Craft DIY Pinterest board here), and finally found the one you see below, made by a proper artist person out of who knows what. Very advanced, but it was a good shape to start with. 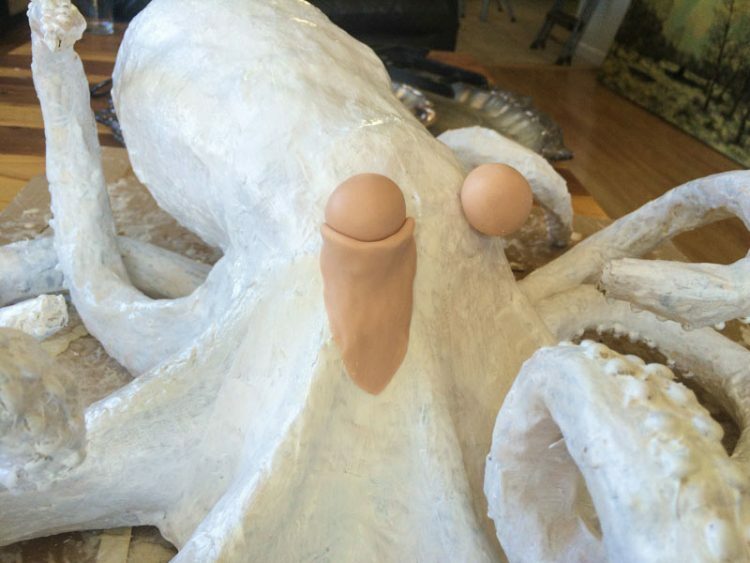 NOTE: Again, the picture below is NOT my finished octopus (I wish), it’s a professional sculpture. My reference. It was really hard to figure out how to credit this artist, as I could only ever find the image by itself, not set into some other page with description. But someone on Pinterest credited a Tasha Vasilek with it, so I’m going to do that too and hope I’m right. When I was first starting out, my intention was for the octopus head to be able to have a light on the inside so that it sorta glowed through it’s head. So I figured the body base and the head had to be hollow. So I found some scrap wire in my craft drawer, and sorta looped it around to make the general shape of the bottom of the octopus, covered it in tape, then paper mached the whole thing. 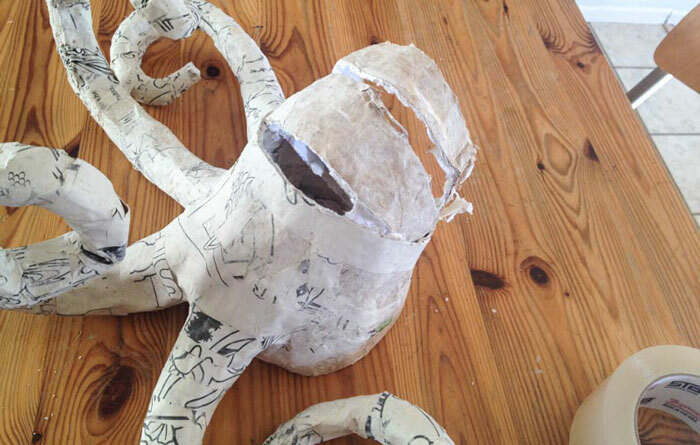 NOTE: In the end, I never did the light-up head idea, so if I were to re-do this project I’d probably just form the body shape out of crumpled up paper and tape, like I do with the tentacles. I also ended up chopping off some of the end of the head to make it a slightly different shape. But oh well! 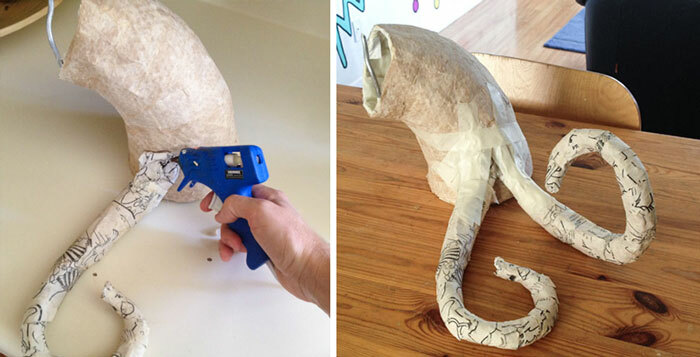 To make the tentacles, take scrap paper and twist and crumple it up into the general shape you want. 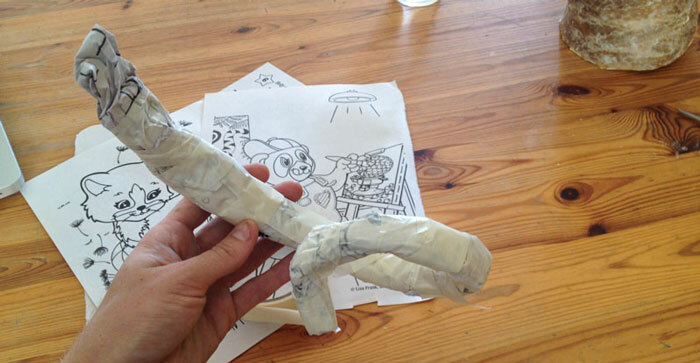 Tape it up so that it holds the correct form for each tentacle. I decide to only do 5 of the tentacles at this point, since I didn’t want the back ones to get in the way of the head. I add the remaining tentacles later. Next you’ll paper mache those bad boys (do a few layers for strength)! You can leave them to dry overnight, or put them in the oven on warm, at no more than 200 degrees F for maybe 20-30 minutes. 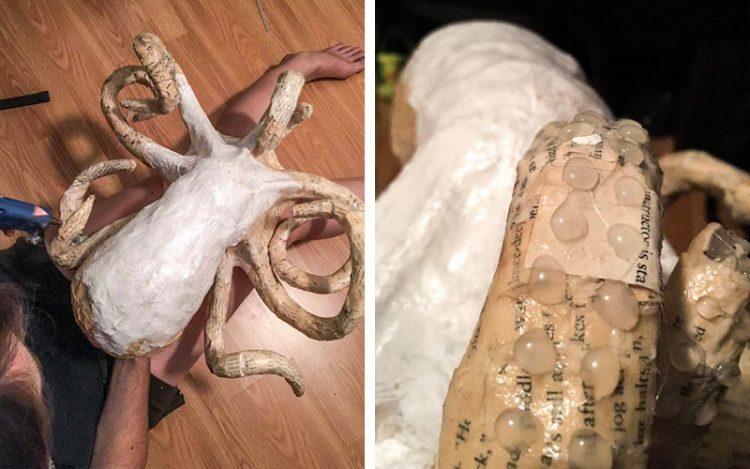 Once you’ve made all the tentacles, you’re going to want to attach them to the main body with hot glue. 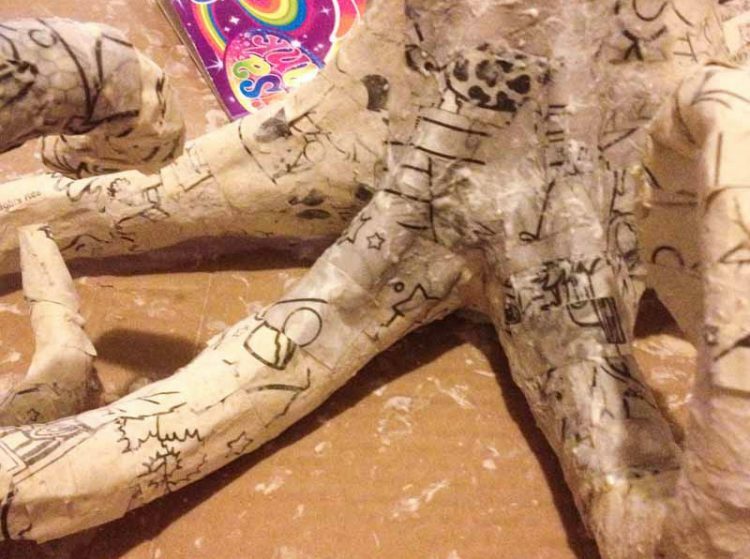 Use tape to make the connection smooth, and paper mache them on. You should always do a couple layers of paper mache, so that when it’s dry and you knock on it, it feels solid and doesn’t squish in. At this point I also decided that the head part was a bit too long, so I chopped some of it off and re-shaped it to bend towards the ground a little more, a little earlier. The above octopus tentacles are the basic shape. They look sorta like cartoon-y versions of what a real octopus has. In my octopus reference photo (in Step 1), the top of each tentacle has what looks sorta like raised tendons that run along the top of it. So I crumpled up a long thin piece of paper (straw-like shape), and taped it down onto the top of each tentacle, and paper mached it on. The other detail for the tentacles is that they are actually webbed, like frog toes. So I paper mached underneath the tentacles, creating a “bridge” the gap between each set, and then flipped it back right side up and paper mached from the center of the top of the tentacles down to the new bridge. 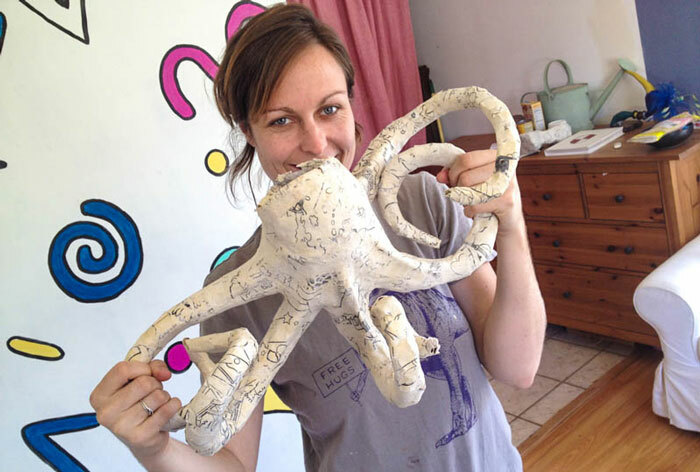 I love using balloons in paper mache—they’re such a useful way to make round shapes without adding weight (e.g. the eyes in my Paper Mache Dinosaur Mask). 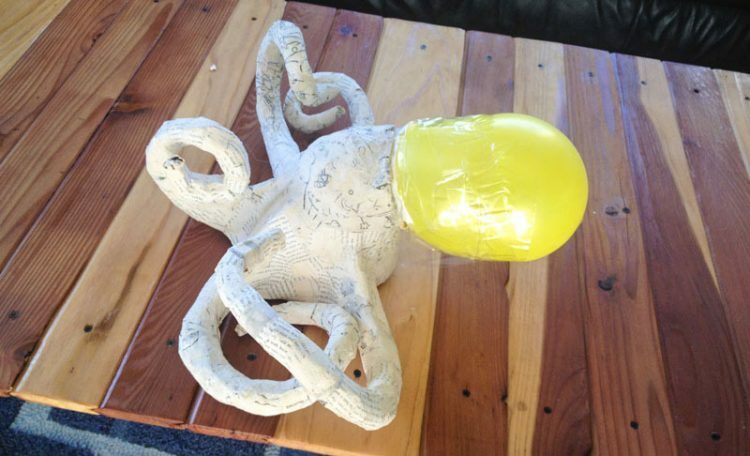 So of course the octopus head is made out of a balloon! Basically blow up a balloon as big as you’d like the head, then tape it to the back of the body area. 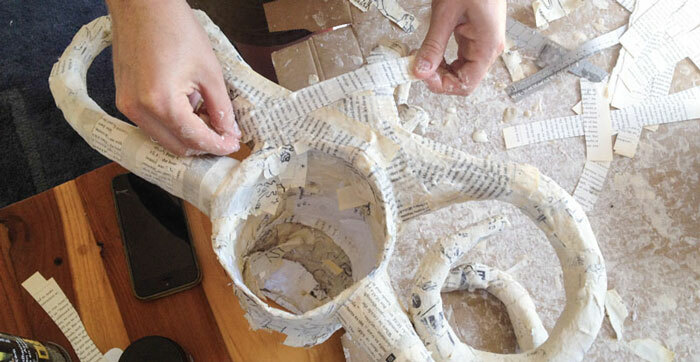 Then paper mache the heck out of it. Do a couple layers so it’s nice and strong, and all the joining areas are smooth and octopus-like. 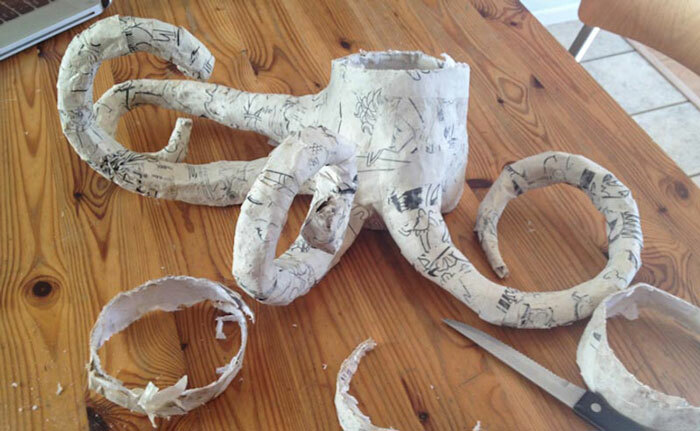 Gotta add some details to those tentacles! 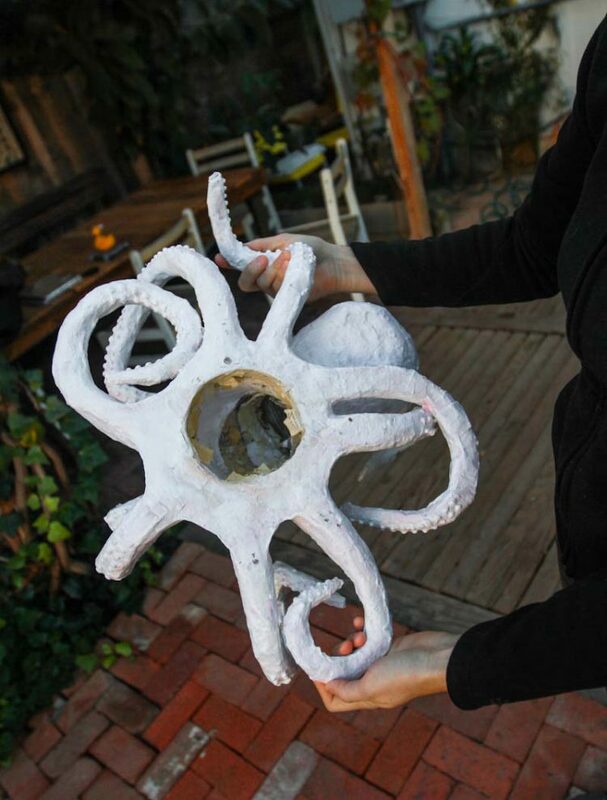 Using a hot glue gun, add big dots all up the underside of the tentacles, in rows of 2. 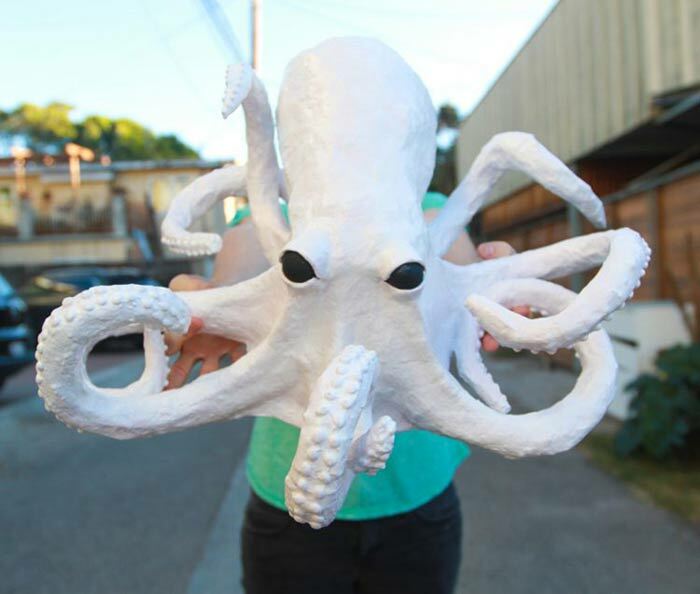 This part of the octopus craft project is super fun. Sculpt the eyes by making three shapes—the “lower eyelid”, the “eyeball” and the “upper eyelid”. 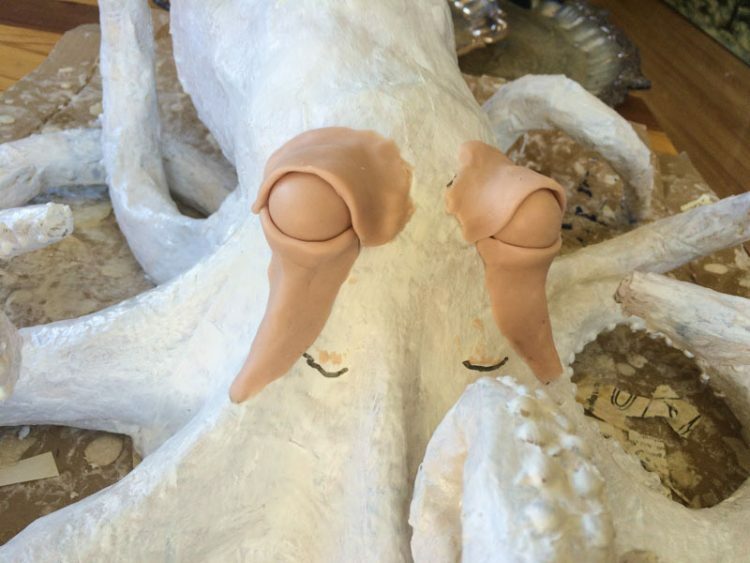 You want the eyeball to nestle in the lower eyelid, and then just fold the upper eyelid over the top of the eyeball and smooth it all down onto the octopus head. Note: I had started painting the whole thing white before deciding to add eyeballs, but it’d be easier to wait until the very end to paint. Then you’ll dry the clay—depending on what type you have, either air dry it, or put the whole thing in the oven on LOW. Be sure it’s on low, since you’re sticking a ton of paper in there. 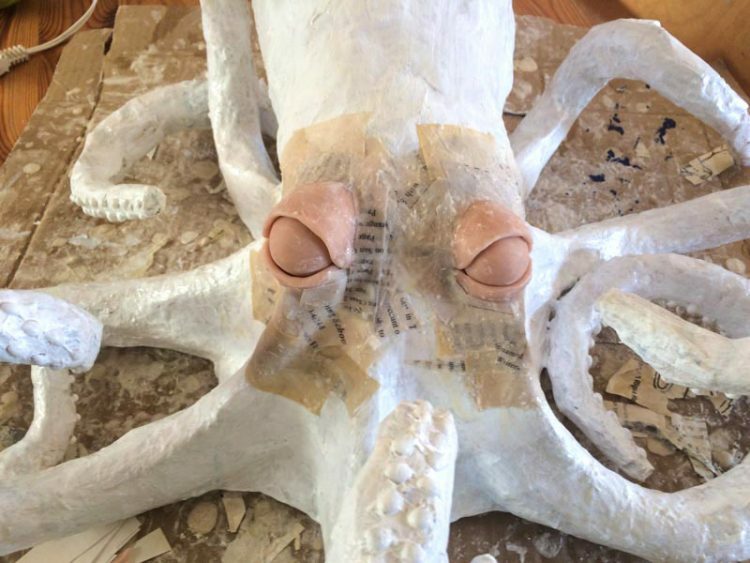 The other option is to just bake the eye pieces separately from the octopus, then glue them on. Next you’ll paper mache over the edges of the clay, to make it all look smooth and uniform. Paint it up however you like. I went with white body and black eyes, since I planned to hang this on my ceiling at a Halloween party, and it felt pretty nice and creepy that way. Excellent octopus! Thanks for the instructions. Great artwork!! 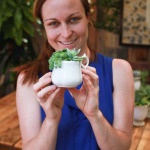 Love the “how to”. Thanks! 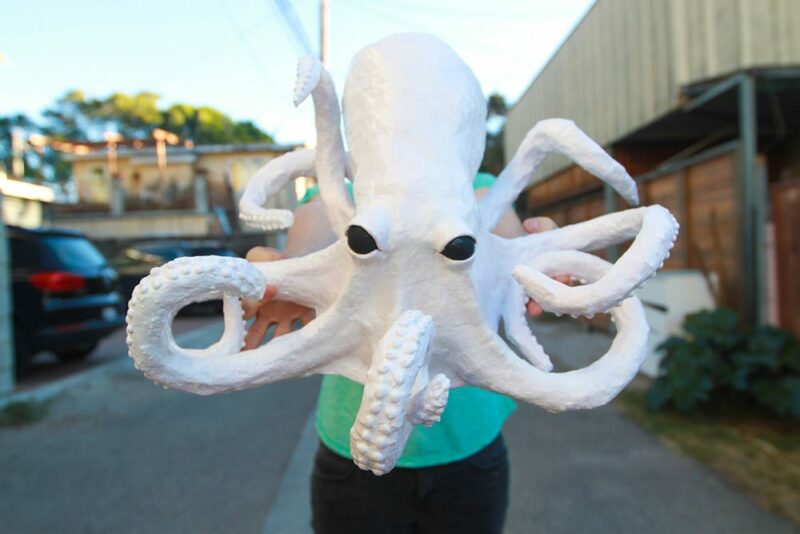 I’m very new at paper machet. How much money goes into a project like this? Could I leave out the clay eyes and just draw them on? 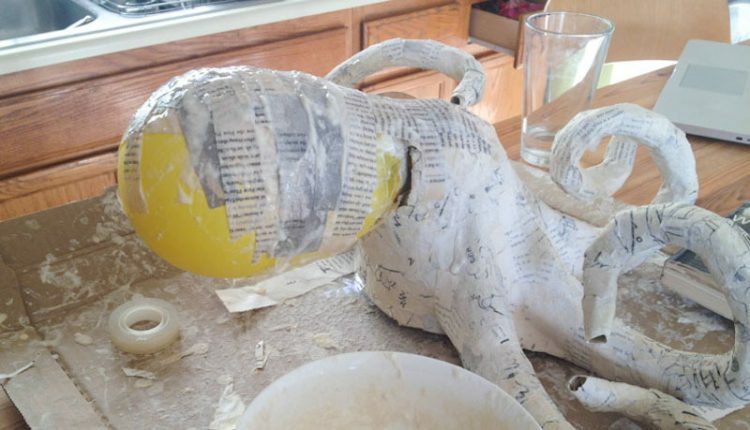 Paper mache is essentially free—it’s just old scrap paper, some flour and water. You could totally make the eyes out of paper mache as well and draw them on, I just don’t think they’d be as smooth. May be you will consider this for VBS 2017. We can scale the size up for our needs. There is another octopus tentacles on YouTube, that appears to be extremely tedious with excellent results. Sorry for my super delayed reply, must have missed this. You can contact me through the contact page to discuss if you’re still interested for a future event. Hello, we found this and my son needs to make an octopus for a school project and I was wondering what kind of wire did you use and where could we find some. also wondering if a dryer hose would work since it’s flexible? Thanks for any info! 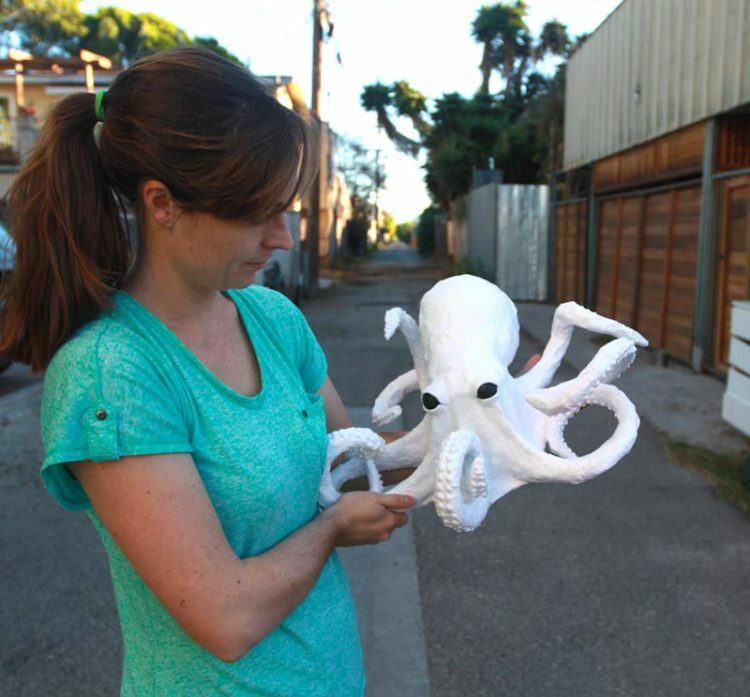 We love your crafty work on your octopus!! Hi there! Thanks for the love! 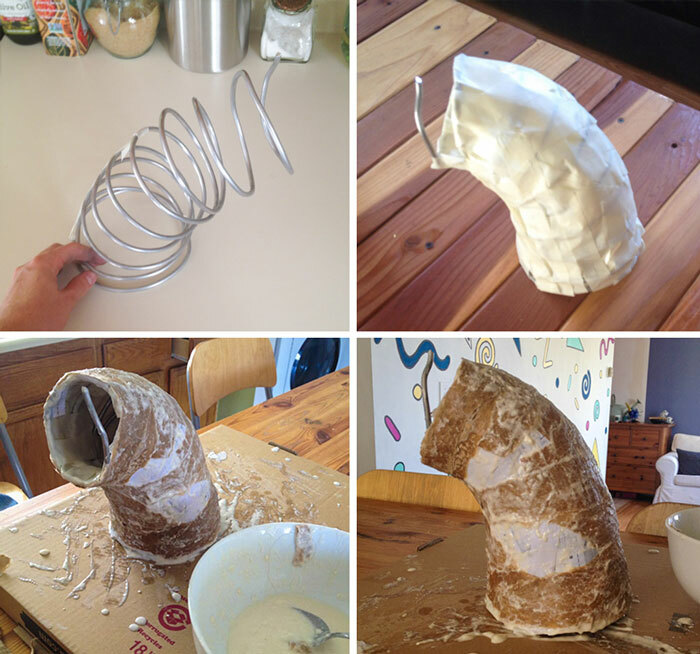 In reality, I didn’t really need to use the wire—you could just crumple up paper into the head shape and paper mache over that, the way I did with the legs. In terms of the wire I used, I actually don’t know—it has been in my craft drawers since who knows when. This is gorgeous! How heavy was it when finished? Aw thanks! Not heavy, maybe 2 pounds max? It’s mostly paper. I must say you are very creative i mean wow! I love to see the creative work like this. es hermoso. me encanto felicidades!!!! What’s a good ratio of flour to water? I love your octopus. I’m making my second one right now and wanted some ideas. One thing I did on my first one was use plastic tubing and cut pieces in about 1/4 inch pieces and glued them on. My next octopus is larger so and I’m using three different size tubing for the tentacles. I love your idea about the eyes but I don’t have clay so I used large marbles. Your ideas are great and will be very useful to me. Thank you. So totally awsome!!!!! Love love love this! 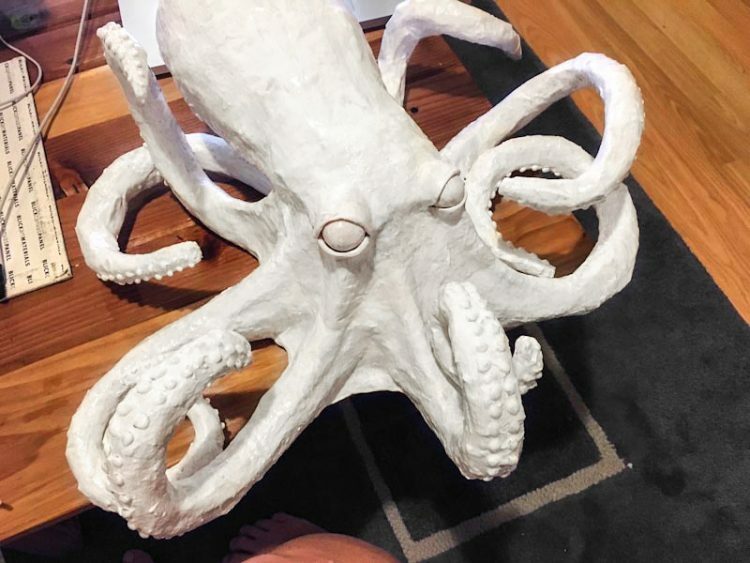 I’m redoing my teenage sons room nautical/under the sea and I’m so wanna do an octopus because of u! Keep up the great work! Hi! I love how this looks. Would you be interested in making a larger modified one for me to have on stage with my music project? We are husband and wife duo that are using nods to sea creatures in our visuals. Hi Veronica! Do you mean as a commission? 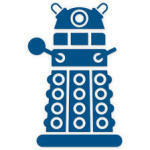 If so I’d be interested in discussing, send me an email (on my contact page). 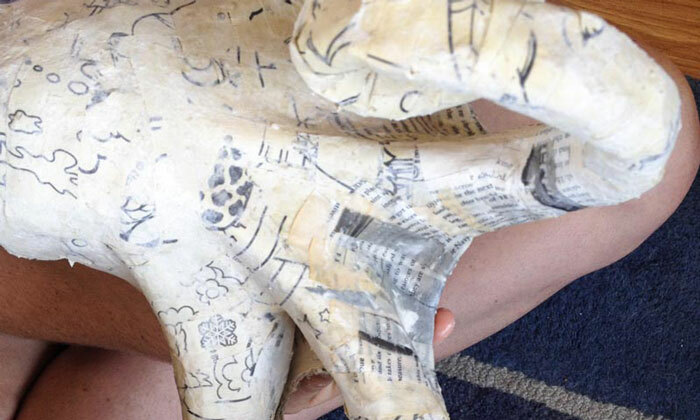 Can the dried paper mache be sanded so its really smooth? I haven’t tried it but I’m pretty sure it can’t. It’d just start ripping the paper. I’d suggest putting on a ton of layers of mod podge or resin instead to smooth it out. And if that wasn’t smooth enough you could possibly sand that. I love to look of this and am totally thinking of using these ideas to make a Halloween costume. An Illithid is a D&d evil race of mind controlling octopus head creatures that live in vast ancient cities in the Underdark. I imagine the octopus will be a lot larger because the central coil will have to skip over my head. What do you think? I’m thinking to use your idea to make a costume next year for Halloween. I want to be an Illithid, or an Octopus headed villain. The only thing is that it would be pretty large compared to yours. What do you think? Or if the costume is really large maybe I’d use one of those hard plastic neck braces and then build the costume off of that to keep it in place better (like this: goo.gl/kqFS6L). 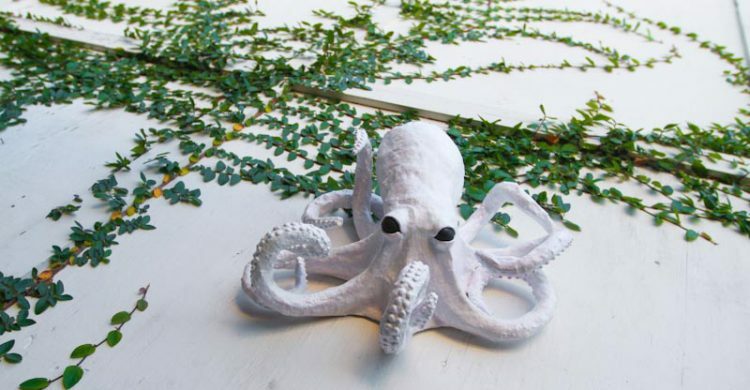 I am interested in commissioning you for a wall octopus. What are your sizes and price ranges. I haven’t done one as a commission before, but we can discuss it via email if you like: le.fairweather@gmail.com.